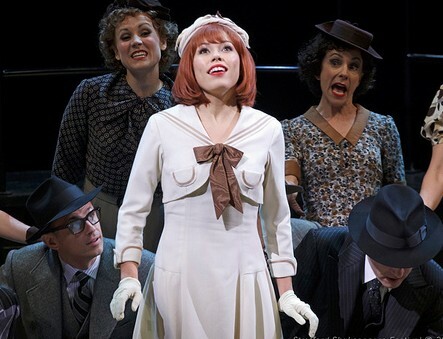 Triple Sensation vet Jennifer Rider-Shaw rose from the chorus to star as Broadway hopeful Peggy Sawyer in The Stratford Festival’s tap-tastic ode to rising from the chorus and making it big. One of our Best Actress in a Musical nominees this year, Jen took the time amidst rehearsals for the coming Stratford season to answer a few of our questions. Yes! I was eleven, I joined a community theatre company and did a production of The Mystery of Edwin Drood. Sunday in the Park With George, West Side Story, Cabaret, Chicago, Into The Woods, My Fair Lady, 42nd Street, Spelling Bee, Chorus Line, Gypsy… The list is endless! Cassie in A Chorus Line, Sally in Cabaret, Velma in Chicago, Louise in Gypsy, Christine in Phantom, Anita in West Side…the list is also endless! I grew up in the competitive dance world in central Alberta. I started dancing when I was four, by the time I was ten I was involved in multiple disciplines and eventually started voice lessons at my dance school. My parents wanted to keep me out of trouble so I was very involved in extracurricular activities. I joined a community theatre group when I was eleven and did various cabarets and musicals through that. After high school I was accepted into the acting program at Red Deer College where I studied for two years. After that I was accepted to Sheridan College’s Musical Theatre Program in Ontario… So I moved to Ontario, studied at Sheridan for a further three years. Sheridan helped me most to hone my skills, we were working seven days a week and were lucky enough to be taught my teachers who were still working in the business. Tell me quickly about your experience on Triple Sensation; I remember you from season two. Triple Sensation was a great experience, I did the show in the summer before my third and final year at Sheridan. I’d had a few friends do the first season and they’d done well so I decided to audition… I did it because I wanted to do the workshops, I wanted the opportunity to study with the amazing teachers/performers that were involved. We were lucky in that our classes were only filmed every few days so we had a lot of opportunity to work and learn in a very safe (camera-free) environment. Working with Larry Moss taught me some very valuable lessons that are still helpful to me. We were very lucky to have some time with Marvin Hamlisch who was incredibly generous and knowledgable. It was an extreme confidence booster for me – It was so intense – and I learned a lot about myself and the sort of performer I wanted to become. It was very helpful to me as I headed into my final year of theatre school… I actually never watched the show (I don’t like seeing myself onscreen), it was a very emotional experience, one that learned and grew from immensely. How did you get your start with Stratford? I actually was hired to monitor auditions (take people’s resumes/photos and show them into the room) in 2009 while they were auditioning for Kiss Me, Kateand Evita. After a few days of doing that, Beth Russell was kind enough to invite me to the dance call. I crashed my bike on the way to said dance call, I was bleeding, my tights were all ripped and I had some serious gravel rash… But I danced anyway, got a callback… I thought thy were just being nice because I was fresh out of school and I’d been working for them all week… But then I got another callback.. And shortly thereafter I was offered a spot in the 2010 company in both musicals! What was it like to break out of the chorus and win the leading role in 42nd Street? It’s somehow very in-character for the show. Describe the rehearsal process for a big Stratford musical like 42nd Street. Stratford is a repertory theatre company so the actors are cast in multiple shows. Usually two, sometimes three. The musical that’s on the Festival stage usually starts rehearsing around the second week of February. After about two weeks we begin our second show and time becomes divided between primary and secondary rehearsals on each show. Last season I was in 42nd Street and Much Ado About Nothing. We are very lucky to have such a lengthy rehearsal and preview process at Stratford. We begin previewing toward the end of April and we open end of May or beginning of June. We work 10-6, six days a week, once we start technical rehearsals the days get a bit longer, but they are extremely good to us here. You shared the stage with some of Stratford’s brightest current stars- Sean Arbuckle, both Kyles- and possibly its biggest musical theatre name- Cynthia Dale. What was that experience like? Fantastic, I’m quite close with Kyle Blair and Kyle Golemba, I worked with Kyle Golemba a few times before and always got on splendidly with him. Both are extraordinarily hard working and so much fun to be around. Sean was an absolute dream, he made me feel so safe, he works so hard and he loves the work. It was a blast and an honour to share the stage with him. Cynthia is a gem, she was helpful and kind to me. She, too, loves the work and was always eager to receive notes and make improvements to the show. I learned a lot from her. She is gracious, patient, funny and loving. How did you approach making such a well-established role your own? I made a point to not watch the 42nd Street movie, I didn’t want to have someone else’s version in my head. Other than that, I drew on my own life experience and was blessed to work with such a fantastic director and choreographer. Gary worked very very hard to dig beneath the ‘fluff’ that is often associated with a musical like 42nd, it was important to him (and all of us) that the show have a heart and soul, not just pretty showgirls. Alex Sanchez was creative and innovative with his choreography, he (very kindly) played to my skills. Also, given that we did the show on a thrust stage made it a unique and original interpretation. All of those things combined to help me create my version of Peggy. I loved doing “Go Into Your Dance”. I loved singing (and playing the scene before) “Quarter to Nine” with Cynthia. “Lullaby of Broadway” was such a fun scene… “The 42nd Street Ballet” – dancing with Steve Cota – was awesome. Peggy Sawyer! I also played Fiona MacLaren in Brigadoon while I was at school and I have a particular soft spot for that role/show. You’re set to come back to Stratford in 2013. Can you give us a preview of your coming season? I am playing Sally Simpson in Tommy, we are in cue to cue right as I write this in fact! I’m also in the ensemble, it’s a blast. We are remounting the original production and are lucky enough to have the original team – Wayne Cilento and Des McAnuff. The new technology for the show is incredible, it is shaping up to be a fantastic show. I’m also covering a few roles in Fiddler on the Roof over at the other house. I’m understudying Tseitl and Hodel.